Josef Vyborny was born Feb 29, 1864 at Pucher No.6. This village is situated between the towns of Caslav and Kutna Hora, Bohemia. He studied at Kutna Hora, Havlickuv Brod (the former Nemecky Brod), Prague (Bohemia), and Graz (Austria). During his time as a student he has made an extensive study of the Vybornys archive materials and wrote "The Vyborny Family Book" using the data. right - aged 23 (format 151 kB). In 1969 Mr. Jiri Vyborny, the son of MUDr.Josef Vyborny ["M.D." abbreviated as "MUDr." in Bohemia and some other Central European countries], wrote several notes at the end of the original "Book". Those brief comments and a couple of remembrances of some neighbors of Pucher village were the only information about both the author of "The Book" and the environment at that time. Just before the anniversary of birth of Jiri Vyborny his daughter Mrs. Alena Haiblikova provided us the following text and pictures which, in fact, could be supposed as some kind of a continuation of the "Vyborny Book". Those data are presented at this website as a memorial to this remarkable family member who helped preserve "The Book" until the present time. Editorial notes are given in a standard font using  brackets in the following text as in another pages of this site. Jan 1, 2000 - this is the 100 years' anniversary of birth of my father Jiri Vyborny. I would like to write several remembrances concerning our family as a memorial to this occasion. He was born at Pucher #6 in the family of the farmer Matej Vyborny. According to family traditions I know he [this father 5Matej(*1841)] was of an outstanding character knowing many (especially religious) books. He was of the evangelic (helvetian) confession and unfriendly toward priests. For some of his statements (which were considered to be against the faith) he once even had to pay a fine. He refused, however, to pay and was imprisoned for 3 days (he wrote "Notes from the prison" there). 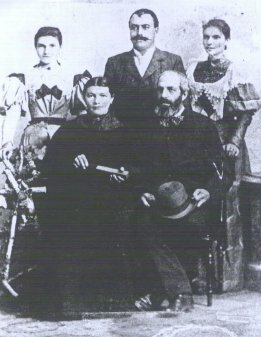 together with her parents and siblings. 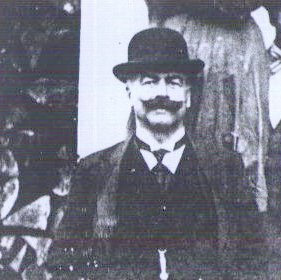 This picture taken around 1870 (- format 90 kB). Right: MUDr.J. 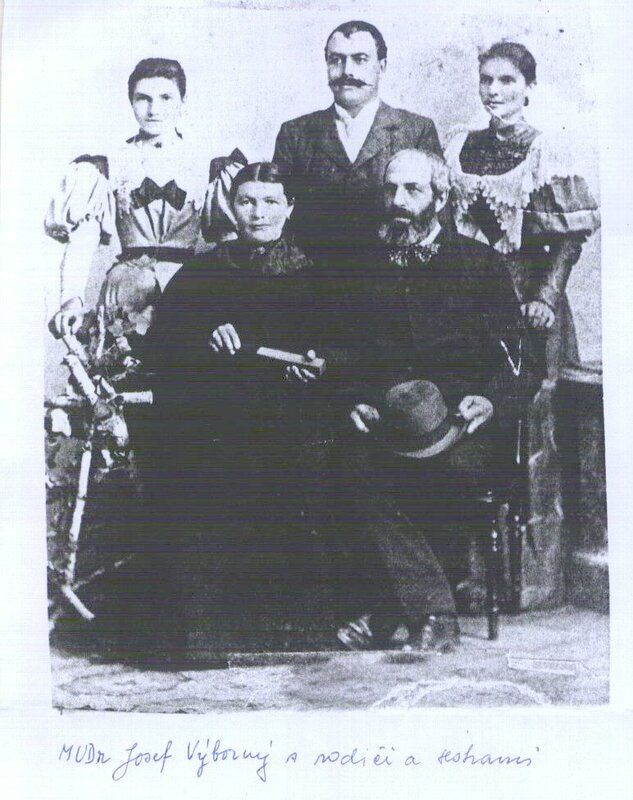 Vyborny together with his parents and sisters (- format 138 kB). He did not like to use the first name Matej [Matthew] so he abbreviated it to Mat. the letter t being slashed such a way to look like Max. He rented his fields because he calculated that the income would be roughly the same and he would not have to do the work himself. His wife was from the miller's family [Barbora nee Novak of Mezholezy #20 and of the water mill Rabstejnka near Kutna Hora]. She was a very careful housewife. Matej has taken a great care for family relations. 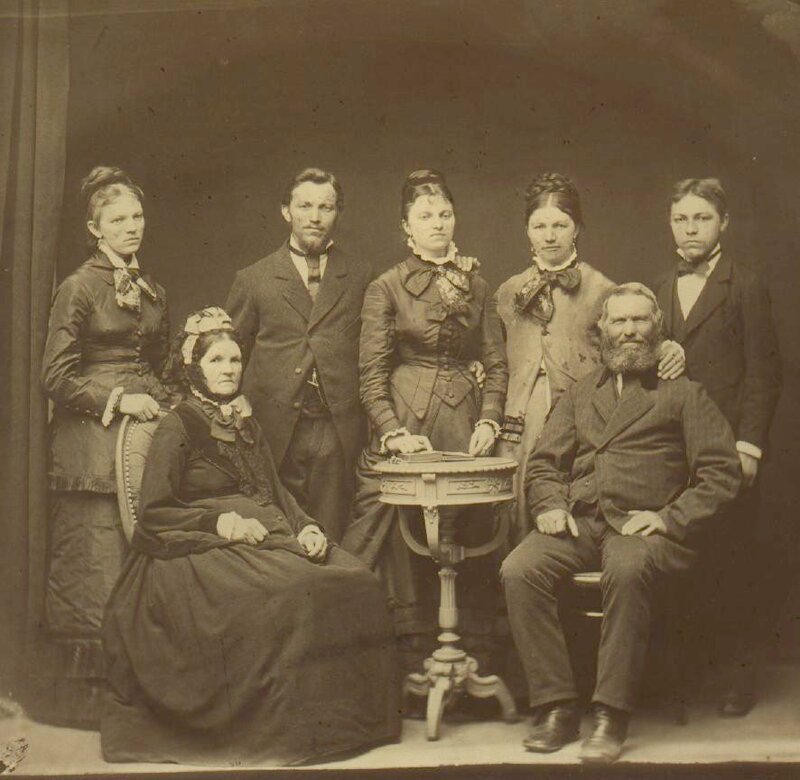 Besides the son Josef[*1864] who studied medicine, he had two daughters: Rudolfa - she was married but died without any children - and Ruzena married to Tacheci. Ruzena was a beautiful young woman. She had four sons and a daughter but her husbant died early. She managed the farming herself, however, quite successfully. Later she passed her farm to the youngest son. All of her children received an education. 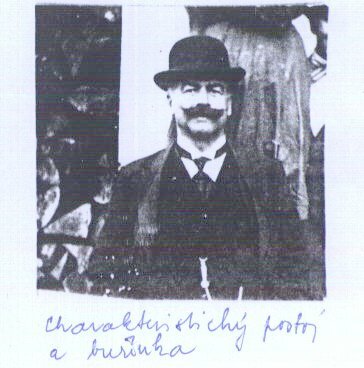 Matej's son, Josef, studied at Caslav, Kutna Hora and at Magdeburg [?]. The family did not have enough money to establish him as a private physician. Therefore he became an "official physician", a position organized by the imperial administration for the larger towns. 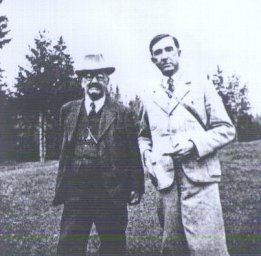 They offered him positions in Trans-Carpathian Ukraine or in the coastal part of present Croatia (both those territories belonged to the Austrian-Hungarian Empire at that time). Josef decided to go to the coastal part. He was employed in the town of Meja near Bakara [county of Rijeka] . After working there for 15 years, he was feeling rather lonely. His loneliness started during his studies and continued during his initial years in Meja (he was not an extrovert type and the language caused certain troubles to him - he could not learn Croatian well even though his whole adult life was spent in Yugoslavija). Collecting of data and improving of "The family book" helped him to stay in contact with his family in Bohemia. One year later he wrote to his father that he wanted to marry. So his father visited his cousin and together they chose from his five daughters - the one who was the bravest and of a corresponding age. The marriage took place during Josef's next visit to Bohemia. There are few details: neither Josef nor Marie [ 4Marie Vyborna] had known each other before. The bride was somewhat taller figure than the groom. 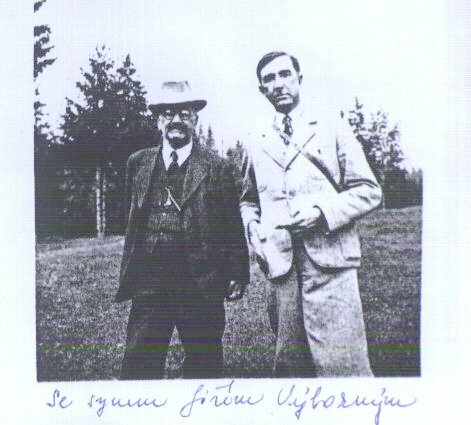 The son Jiri Ljubomir [ 3Jiri*1900] (one name for each country) was their first child. After seven years the daughter Milada Ruzena [ 3Milada*1907] was born. The latter has lived her whole life in Yugoslavija, neverthless her spoken and written Czech was perfect. She had a son who, however, died during the war together with her husband. She married again and had a daughter after the war. Josef was not well suited for Meja, because of both the climate and the general style of living there. He found better conditions in Cabar town situated in the mountains near the boundary between Croatia and Slovenia. He lived there until the end of his life. So he was known as "the doctor of Cabar" among his relatives. A typical view of MUDr.Vyborny wearing a hat. When he did not feel well, sometimes, (like when he had the flu, etc) he simply started to work very hard (e.g. he brought in a big heap of wood for heating to perspire strongly) and his health recovered soon. Jiri Vyborny wrote in his notes to "The Book" that his father was a physician to the local partisans fighting against occupying forces in Croatia during the last year of his life. He died in December 1943 and his military-style funeral service was prepared by the citizen of Cabar. Josef's son Jiri Vyborny (born Jan 1, 1900), studied Latin and French languages in Prague and Zagreb (Croatia). At first he was a teacher in Yugoslavija. After the war he returned to Czechoslovakia and settled in the town of Jablonec on the Nisa River (North Bohemia). He taught in the high school ("gymnasium") there and later became a director of that school. MUDr. Vyborny together with his son Jiri(*1900). His students liked both his educational style and great knowledge. His French diction was very good. Jiri married his neighbor from Cabar and they had two daughters. One of them died as a child. The other daughter has continued in the teacher's tradition of their family. The surname Vyborny, therefore, will no longer continue in this family branch. Despite the traditional surname Vyborny are lost by some branches, the continuing family relations are traceable (in archive documents, etc). The present level of knowledge of the details of family trees is sufficient enough to continue the study of many of the family lines. Back to the page "The Book"